Eugène Atget was born in Libourne, France in 1857. He trained as an actor but during the 1890s as his career stalled, turned to photography and began what became his life’s project. Utilising a glass-plate tripod camera, Atget comprehensively documented the old city of Paris, recording its picturesque scenes, architectural details, and on occasion the people of its working and lower classes. In doing so he built a photographic archive of some 8500 images from which he derived a meagre income, selling his (mainly) albumen prints primarily as visual references for artists and designers, but also, as documents to Parisian libraries and archives. His photographic compulsion was also a deeply personal one. Transporting a cumbersome camera and glass plates and often returning to the same locations to record different aspects or changes over time, Atget’s dedication not only to his photographic project, but to his subject, the city of Paris threatened by the ongoing processes of modernisation, is evident. Often working in sequences - capturing a street scene before moving in to record individual façades, then closer details such as signs and ornamental details, Atget created a photographic vision of Paris that, like memory, appears both cohesive and fragmented. ‘Rue de l’Hôtel de Ville’ is one of several Atget recorded within this specific locale inside the Quartier Saint-Gervais, the 4th arrondissement of Paris. Images of two shop facades (a café at number 62, and the barred premises seen on the right in the street scene) exist, as well as a view taken looking from the opposite end. Most interestingly is an alternate version of the ‘Rue de l’Hôtel de Ville’ street scene, taken by Atget at a different date, depicting the street lined with cobblestones instead of the flat paving stones. Returning to the same location Atget’s camera records the subtle effects of time and progress upon his city, while the presence of a figure in the doorway on the right that appears in both, hints at the methodical nature of the photographer’s approach. In his own lifetime Atget’s photographic achievement went largely unrecognised. It was only in the last years of his life that he began to find a new and appreciative audience through the efforts of American photographer Berenice Abbott and the interest of a younger generation of artists, including the surrealists, who recognised in his work an aesthetic sympathetic to their new view of the world. 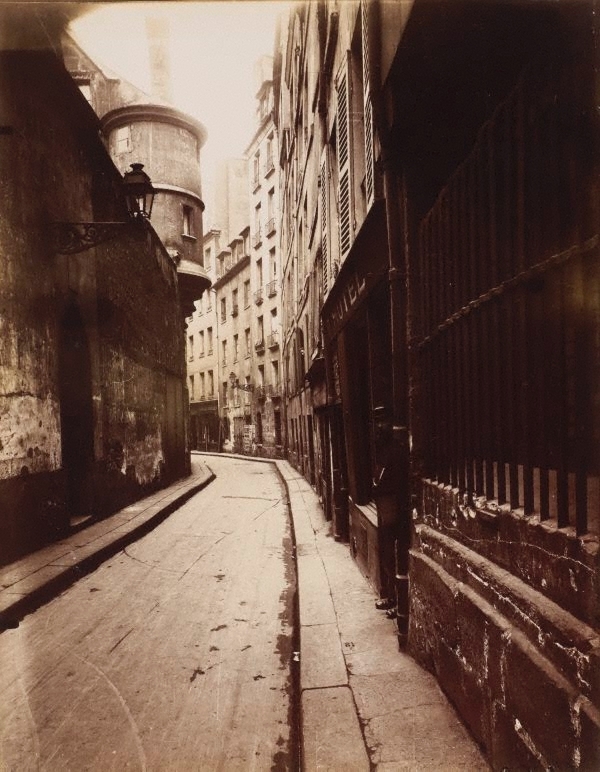 In Focus; Eugène Atget: photographs from the J Paul Getty Museum , 2000, 65 (illus. ).